It’s Book Blogger Appreciation Week again! A major focus of Book Blogger Appreciation Week is the awards, but I have always kind of felt ambivalent about the awards. Frankly, there are so many great book blogs that may not be nominated for a variety of reasons, and even leaving that concern aside, I have had a rather long history of just not understanding blog awards. Still, congratulations to the nominees. Today I want to highlight a couple of book bloggers I particularly enjoy reading, and I’ll try to explain why. Obviously, I love so many blogs, and it’s hard to write posts like these because just like on the Academy Awards, you invariably do something stupid like forget to thank your husband (who by the way, writes wonderful blog posts, but not about books—er, my husband, that is; maybe yours does, too, but I wouldn’t know that). First, I truly enjoy Jenny’s Books. Jenny’s reviews are always well-written and quite funny. I enjoy her selections, too. Jenny is kind enough to comment here regularly. I admire so many book bloggers for being good commenters. I read all your posts, I really do! What I need to do more often is leave a word or two. Jenny has great conversations in her blog comments, too. I also love reading Jenners’s posts at Life with Books. Her posts are funny, and I love hearing about the Little One, too. Oh, and Mr. Jenners, of course. We have similar tastes in reading, and she has influenced me to add several books to my TBR pile. Plus we sometimes wind up reading the same books around the same time, and it’s fun to talk with her about them. Iliana has influenced me in so many ways. Her blog Bookgirl’s Nightstand is such a wonderful blog, and she has so much stamina. She is such a wonderful artist, too. Have you seen her handmade journals? They’re beautiful! I was lucky enough to win one. I want to be like Iliana when I grow up. I’m also jealous of her trips to Germany. Stephanie at Reviews by Lola is so awesome in so many ways. She reads so many books. I cannot figure out how she reads so many books so fast, but I wish I could be like her. She has influenced me to pick up several books or at least add them to my TBR piles. I love her succinct, helpful reviews, too. In addition to book review blogs, I also like blogs about literature and writers. One of my favorites these days is Better Living Through Beowulf. Robin Bates, the author of this blog, explores literature’s relationship to everyday life. He sees allusions and connections in everything from sports to politics to spiritual matters, and his ability to connect literature to life amazes me. I have been a longtime fan of Jane Austen’s World. Vic covers everything from Austen sequels to life in Georgian England, and I have learned so much from her blog. Finally a new blog that I have been enjoying is Madame Guillotine. Melanie has really influenced me more as a fiction writer than as a book blogger. I like her independent spirit, and because of her, I decided to just go ahead and put my book on the Kindle, which has definitely increased its audience over just Lulu alone (you can order it in the sidebar). Her struggles and triumphs as a writer are fun to read about. I feel sometimes like a silent cheerleader (that whole needing-to-leave-more-comments thing). 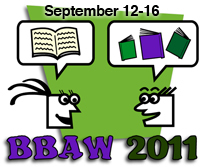 The goal for Thursday’s blog theme for Book Blogger Appreciation Week is to share what you enjoyed about BBAW and also what your blogging goals are for the next year. My favorite part was interviewing Jenny from Take Me Away. I love to get to know other bloggers, and it was really fun for me to think of question to ask, and it was fun for me to answer her questions, too. I think no matter what choices are made for next year, interview swaps should always be a part of BBAW. My goals for next year are to create a reading challenge (although I saw someone else already had the same idea I had; still, I think I will try to do it anyway). I also want to participate in and complete as many fun challenges as catch my eye. I think reading challenges are one of the easiest and best ways to feel like a part of the book blogging community. I want to try to read 50 books. It might be possible since I am graduating from graduate school this December, but right now in mid-September, I’m sitting on 28 finished books. That is 22 away from 50, so I don’t think it will happen this year, but only 12 away from 40. It’s my hope that I can read 40 by the end of the year. We shall see. Another thing I’d like to do next year is continue to follow a blogging schedule. It seems counterintuitive, but putting myself on a schedule actually made me fall in love with this blog all over again. It gave me direction and purpose, and before long it didn’t really matter if I followed the exact schedule or not: I was blogging a lot more. What did you like about BBAW? What are your goals for next year? Today’s topic for Book Blogger Appreciation Week is to share whether or not I’ve tried a new book or genre because of the influence of a blogger. In a roundabout way, yes, I have. I follow a lot of readers on Twitter, although they don’t necessarily all have blogs. I picked up Suzanne Collins’s Hunger Games trilogy because of all the tweets and reviews of Mockingjay. More than bloggers, however, Valerie Jackson’s show Between the Lines has convinced me to read a book, including John Burnham Schwartz’s The Commoner, which turned out to be a great book, The Three Weissmanns of Westport, which was pretty good, and American Music, which I didn’t like as much (and didn’t finish). I have also purchased books Ms. Jackson discusses, but haven’t necessarily finished yet. Carl’s R.I.P. Challenge has encouraged me to use the excuse of creepy fall reading to read some authors I had been meaning to get around to anyway, such as Neil Gaiman and Daphne DuMaurier. I don’t think I’d have picked up Georgette Heyer’s Charity Girl if Laurel Ann hadn’t asked me to be a part of the Heyer birthday celebration at Austenprose. I also picked up The Annotated Pride and Prejudice after first seeing it mentioned on a Jane Austen blog. What about you? Has a book blogger ever convinced you to pick up a book? 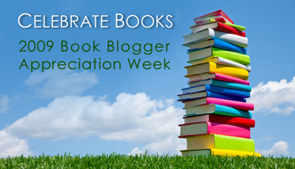 Happy Book Bloggers’ Appreciation Week! I will catch up with the festivities soon, I promise. Meanwhile, I interviewed Jenny who blogs at Take Me Away as part of the BBAW book bloggers’ interview swap, and I’m so happy to have found a new blog to read! My questions and her answers appear below. I live in Central Florida with my husband and dog. I work as a social worker and am also doing an internship as a mental health therapist, so I’m pretty busy! And I love to reading and blogging. That’s pretty much it! How did you choose the title for your blog? I wanted a name that was somewhat unique and that described what books were for me. I called it Take Me Away because that’s what I feel books do… whether it’s that I’m “literally” being taken away to another state, country, etc. or just that I’m being “taken away” from real life, stress, etc. In that sense, reading is an escape for me! A few years ago I joined paperbackswap.com and started playing in the games forum. It was fun getting to “meet” so many other readers. There were a couple people on there who had book blogs and that was when I first learned of them. I thought it sounded like fun to write about the books we read. Plus, I tend to forget about books shortly after reading them, even if I love them (LOL), so I thought blogging would be a good way to document my thoughts that I can look back on and remember. I see you have participated in several reading challenges this year, including the Brontë one I did as well. Can you talk about which one is your favorite and why? Why do you do reading challenges? What do you like about them? This is sort of a funny question for me…. see, I join challenges with the caveat that they will not stress me out—they’re more something I strive for. So it’s almost like the challenge is there and I join them but then don’t think much about them. In reality, I don’t ever choose books to read for challenges… it’s more like I read whatever and when that challenge ends I figure out how much of what I read fits in that category; though I’ll admit it is fun when I know a book I’m reading will meet the requirements for a challenge. If I had to pick a favorite I would say either of the “imprints” challenges like the Amy Einhorn one or the Reagan Arthur one… I think the ones that have the most eclectic choice of books to choose from are my favorites. Or the 1001 Books to Read Before You Die one because I feel like I’m reading some good, important books! Do you set a rhythm or schedule for updates? If so, what? On a regular/good week I was aiming for 2-3 book reviews. I’ll substitute some type of bookish topic for a review if I have something to say. But lately my reading slowed down considerably (August was a rough reading month) so my posts were much more sporadic. I’m just now starting a new feature where on Fridays I am posting a review of a short story from an anthology of short stories that appeared in The New Yorker. So I think I will aim for 1-2 book reviews/posts other than that each week. And I pretty much try to separate all my posts by 2 or 3 days. I currently have 5 book reviews ready to go whenever I want to post them, but this is by far the most I’ve ever had prepared at once!! Hopefully I’ll be able to keep it up though. I am truly an eclectic reader. I have favorite genres but even with those I feel like I have to make a departure from them every once in a while. I really enjoy women’s fiction, contemporary fiction of all types, literary fiction, and mystery/thrillers. Even with mystery/thrillers, though, I prefer the ones that are more literary in nature. I really like reading books that make me think about an issue and/or that can lead to interesting conversations. But then I also like fun, fluffy books every once in a while too! Do you have a favorite book? Or a shortlist of favorite books? If so, what is it/are they and why? Ahhh, my favorite books change all the time! Currently, I say my favorite is A Tree Grows in Brooklyn. For a long time Wuthering Heights was my favorite. Strangely, one of my favorite books is Daughter of the Forest (the first in the Sevenwaters trilogy). I say strangely because I typically am not a fan of that genre! But I’ve read that one 3 or 4 times. I really loved Snow Flower and the Secret Fan and Shanghai Girls both by Lisa See. I Know This Much is True by Wally Lamb was absolutely fantastic and I considered it a favorite too but I’ve only read it once and haven’t had a chance to read it again to confirm it’s still a favorite. Some of my favorite “fluffier” books are Jemima J by Jane Green and Confessions of a Shopaholic by Sophie Kinsella. I know there are so many other great books out there, though, that will become a favorite that I just haven’t had a chance to read yet! Do you use book blog reviews when trying to decide whether or not to read a book? What about Goodreads, Amazon, or the like? Yes and no. If I see a book in the store that looks good and I haven’t heard about it before, I may buy it without looking into reviews. But definitely when I do read reviews for books I can be swayed into buying/reading a book as well as talked out of it. I sometimes use the user reviews at bn.com, but for reviews I usually refer to book blogs. Can you talk about Throwback Thursday, the book meme you created? I created Throwback Thursday because most book blogs tend to focus on newer books and/or books that are only just now being ready by the blogger. But most of us have been readers for years and have extensive lists (physically or not) of books we have read in the past that still deserve recognition! I used to do the meme weekly but after a while had difficulty keeping up so now I have it on a mainly monthly schedule. I love talking about and remembering older books that I’ve read though! Who is the coolest author you ever met? Hmmm, coolest author…. I went to a luncheon/reading once for Jodi Picoult. There were so many people that even when having books signed we couldn’t really talk, but she sounded really intelligent when she gave her speech at the luncheon and was really nice. I met Kristy Kiernan at a local signing and she was sooooo incredibly nice and personable. I really liked her a lot. I can’t remember if there are many other authors that I’ve really had much of a conversation with (ahh hope I’m not leaving anyone out!!) I think Lauren Oliver is an awesome person based on her blog, and I have met her (at BEA), but my interaction with her was very short. Who are your favorite book bloggers? Thanks Jenny for letting me interview you and for the opportunity to learn more about you! You can read Jenny’s interview of me at her blog. Bookish Nose: Jordan often reviews books I’ve never heard of. He was one of the folks who made me want to check out The Hunger Games trilogy. DeRaps Reads: Hattie is a fellow English teacher and frequent commenter on my other blog. I like to keep up with what she’s reading, too! I love learning about new YA books. Find Your Next Book Here: I actually just discovered this blog through BBAW. Jenners and I seem to circulate in the same areas of the book blogosphere, so it’s strange I hadn’t bumped into her before. I really like her posts for Show Me 5 Saturday. Following Jane: David’s experiment is to read all of Jane Austen’s novels and share the experience with his readers. Forever Young Adult: I love the humor in this blog. Plus they squeed over Mockingjay and allowed the rest of us to participate and enjoy. Jenny’s Books: Jenny’s reviews are often funny and always helpful. I need to check out Diana Wynne Jones. Jenny’s the second person I’ve heard recommend Jones’s books. Reviews by Lola: I love the way her blog looks. Everything is so organized. Plus, fellow Hunger Games fan and great reviews. Stephanie’s Written Word: Stephanie just celebrated four years of book blogging. She hosts the Everything Austen Challenge, and I just love her reviews and tweets. So who have you discovered since BBAW last year? I love book bloggers who can inject a bit of humor into their writing. Humor is a little lacking over here at Much Madness is Divinest Sense, but perhaps that needs to change. The one review I wrote that included a little bit of humor because I was in a weird mood that day was so much fun to write. Of course, I am not sure that’s something I could sustain, and it isn’t even appropriate for all the kinds of reviews and writing I do here, but it’s something to think about. Also, I really admire Jenny’s reviews, and she is so often funny, as are the wonderful ladies at AustenBlog. Given we are trained not to judge a book by its cover, what does my admiration for design have to do with anything? Well, I think if your site looks nice and is easy to navigate, it tends to say something about how seriously you take it. Maybe that’s not true in all cases, and frankly, if I like your blog enough, I’m probably reading it in Google Reader and only see the design when I comment, but I did tend to prefer the blogs that looked good and weren’t too cluttered with content, but still had some extra eye candy in the sidebars and images (that worked) in the posts. I myself was way too chicken to enter my blog into this competition. Stefanie shared her responses to this meme for Book Blogger Appreciation Week. Consider yourself tagged if you want to play along. Do you snack while you read? If so, favorite reading snack? Sometimes, but the snack varies according to what I’m craving. I do find it difficult to eat a full meal while reading, but note I said “difficult” and not “impossible.” I always read when I’m eating out alone. Do you tend to mark your books as you read, or does the idea of writing in books horrify you? It depends. I absolutely mark my professional reading or school reading. Pleasure reading? Not so much, though sometimes. When I do mark, my tools of choice are pencil and/or yellow highlighter. How do you keep your place while reading a book? Bookmark? Dog-ears? Laying the book flat open? Most of the time, I use a bookmark. I can’t stand dog-earing pages, and I hate it when someone does that to a book I loan out. I do lay the book flat open if I’m going to turn right back to it. Fiction, Non-fiction, or both? Both, but I definitely prefer fiction for pleasure-reading. Hard copy or audiobooks? I think the costs for audiobooks are prohibitive. I can get a paperback so much cheaper. That said, I do like them and will listen to them. I forget to get them at the library. Are you a person who tends to read to the end of chapters, or are you able to put down a book at any point? I like to wait until the end of a chapter before putting a book down for any length of time, but if I can’t do it, I have to at least end at a paragraph. I can’t stand it when I’m interrupted in the middle of a sentence. If you come across an unfamiliar word, do you stop and look it up right away? Only if I can’t figure it out in context. I am reading Crime and Punishment via DailyLit and had to look up casuistry this morning. Of course, sometimes the fact that I don’t look words up sometimes means that I don’t immediately get the exact meaning from context and consequently use the word wrong. What are you currently reading? Crime and Punishment in tiny bites from DailyLit, Dracula on my iPhone, and Grendel, but I think I’ll finish Grendel tonight. What was the last book you bought? See my previous post for the full list. Are you the type of person that only reads one book at a time or can you read more than one at a time? I used to read just one at a time, but over the last couple of years, I found I was able to read several. I don’t think I could do more than two at a time if not for DailyLit, however. Do you have a favorite time of day and/or place to read? Evening before I settle in. I also like to read in the bath when I can. Do you prefer series books or stand alone books? I don’t have a preference as long as the series is good. I hate getting sucked into a series only to have it be uneven or end poorly (cf. the Twilight series, or at least in my opinion). How do you organize your books? (By genre, title, author’s last name, etc). In stacks and piles with no scheme whatsoever. It would most likely make you cringe. I would say that reflecting on the books I’ve read, especially at the end of the year when I count my books based on the number of reviews I’ve written, is a highlight for me. I enjoy reading other book bloggers’ reviews, too. There have actually been quite a few: Vic at Jane Austen’s World, Iliana at Bookgirl’s Nightstand, and Murray of The Literarian have all been very encouraging of this blog. This is a tough one for me because I didn’t participate last year, so I’m not sure what to ask. I am excited that BBAW happens during the week of my birthday. I suppose my biggest question is what would I need to do that week?